Vacations in Napa Valley can be fun, but some of the activities might stress you out. Shopping, sightseeing, dining out, doing high-intensity sports, attending a flurry of concerts and other events, as well as experiencing a handful of wine tours can really drain your energy. After that flurry of activity, it’s no wonder you need rest and relaxation to get your batteries recharged. Fortunately, Napa Valley has plenty of places to relax, recharge, and rejuvenate. Having uninterrupted views of the vast fields of the Napa Valley from your hotel terrace while sipping a glass of wine is relaxing already. But are there other things you can do, as well? You may want to visit the vineyards and the wineries but at the same time you don’t want to get stressed. The best idea to do this is through biking. Rent a bike and pedal your way among the vineyards — you will feel the thrill of “gliding” and at the same time you also feel relaxed, since cycling is a low-intensity sport. You will also get to breathe fresh air, too! Napa Valley features the best resorts for relaxation. Almost all hotels in Napa offer spa services as well as relaxation services. Take a dip in the healing waters with rose petals floating around you. Or take a dip in the heated pool or hot tub; you can also lounge at the poolside cabanas. Have a relaxing retreat at one of the many massage/therapy and spa centers and try out several popular types of massages. The most common is the Swedish massage, which is recommended for those who haven’t been to a massage before. Or you may try others like the aromatherapy massage, the hot stone massage, shiatsu or Thai massage. Probably the most popular and enduring spa is the multi-awarded Mount View Hotel and Spa, but you can check out any of the other great spas out there in Napa. If you want to relax and detoxify your body at the same time, have a mud bath or take a dip into the hot pool. The Napa city of Calistoga, for instance, is famous for its natural hot springs, so it is not surprising that it boasts many mineral pools and mud baths. These mud baths and geothermal pools are purported to have therapeutic and rejuvenating properties. Relax (perhaps even fall asleep!) while you’re slathered with the minerals-rich mud bath or soak in one of the mineral pools. Having a hot air balloon flight can also be relaxing. This will help you get away from much of the crowd, the noise, and the madness that you’ve encountered while you’re on the ground. As you go higher up in the sky, serenity will be easily achieved — just relaxing yourself and enjoying endless views of the gorgeous Napa Valley scenery. Grapevines laden with grapes, the deep valleys and the rolling hills — all of these look even more beautiful from a bird’s eye view! Even though hot air balloons won’t make you scream like a ride at a theme park would, nevertheless you will still feel the thrill of being actually up in the sky! It is the only activity where you can feel tranquility, relaxation as well as thrill and excitement all at the same time. And the beautiful scenery will never, ever fail to take your breath away. Balloons Above the Valley (BATV) guarantees you will have the most relaxing hot air balloon flight ever! Our experienced flight crew will put you at ease and at the same time entertain you with stories and information about the more interesting spots in Napa as you fly along. BATV’s freshly prepared breakfast will get you ready for the flight and a post-flight champagne brunch in an idyllic wine country setting celebrates your successful flight. Hot air balloons have a unique combination of serenity, thrill, excitement and fun. 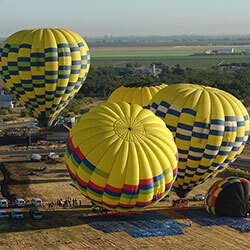 Do not forget to include hot air balloon flights if you plan to have relaxing but fun vacations in Napa Valley.